THE FASTEST DRIVERS. THE TOUGHEST TEAMS. THE GREATEST RACES. SHOWCASE EVENTS FROM COMMUNITY SERIES ACROSS FORZA MOTORSPORT. The Monaco Grand Prix, The Indy 500, The 24 Hours of Le Mans. Some races offer more than just championship points. Exclusive to Forza Motorsport, the YMTV Super Trophy takes in only the greatest races from the best racing series. Success in the #YMTVST officiated events will earn you a place in YMTV driver and team rankings. Events are added to the #YMTVST calendar as and when they are announced. Be sure to check Discord and Twitter to keep up to date. All #YMTVST races will contribute towards team and driver rankings. Each YMTVST race will feature 1) A Best Paint Poll 2) A Best Tune Prize for Pole position. The winners of this will receive a bonus in team rankings. The British GT series takes to the challenging Spa circuit in Belgium for this classic race. A one model race featuring the brilliant M1 Procar around the Hockenheim circuit. Touring Cars return to Brands Hatch for what is always a highlight of the racing season. Choose your favorite pocket rocket and prep it for a 2 part race around the Nurburgring GP circuit and the iconic full Nurburgring track. Step back in time with the brilliant Mercedes 190E, Sierra Cosworth and BMW M3 ’91 for a classic night of racing. Ranks are established only through results in the ten most recent #YMTVST officiated events. They are weighted towards the most recent race events. From the results of a given YMTVST race, the winner will always rank best, second will always rank second best, etc. 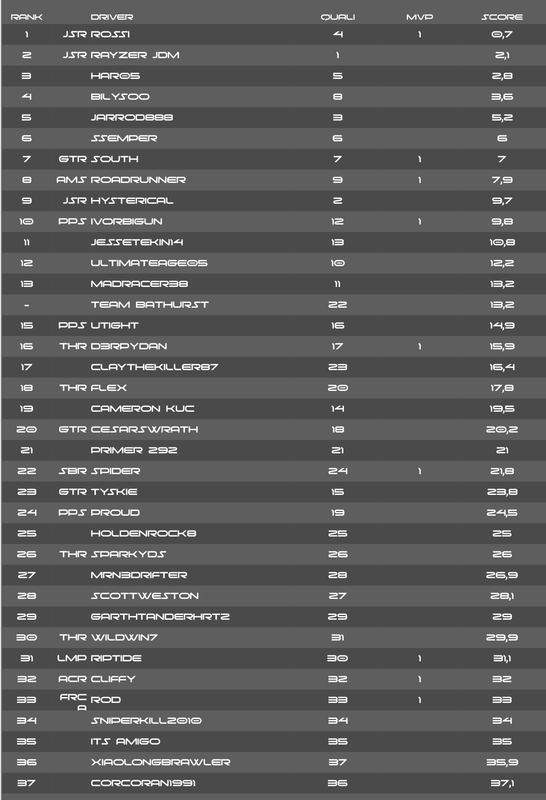 That said, winning from a tougher grid position is rewarded in the rankings. The most successful drivers in the YMTVST. The most successful teams in the YMTVST. Rankings are based on race results of the top 3 drivers in each given team. A team is designated by the short (often three) letter prefix before a drivers name. Alongside race results the rankings reflect the team who 1. Won The Qualifying Pole Position. 2. Won The Best Paint Vote. 3. Won The Most Cumulative Overtakes (Team Ride).